Traditional puukkos manufactured on a large-scale include Marttiini and Iisakki Järvenpää Oy. Beautiful knives worth checking out if you have an interest in knives or superb craftsmanship. 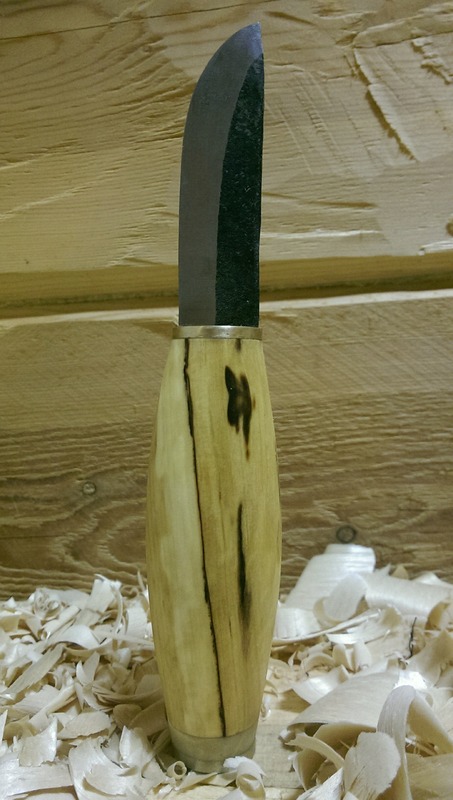 The Swedish Mora knife is also considered a puukko in Finland. They are cheap with a superb quality blade. There’s also a wealth of smaller knife manufacturers across Finland, producing bespoke designs that are forged in the traditional ways of times gone by. 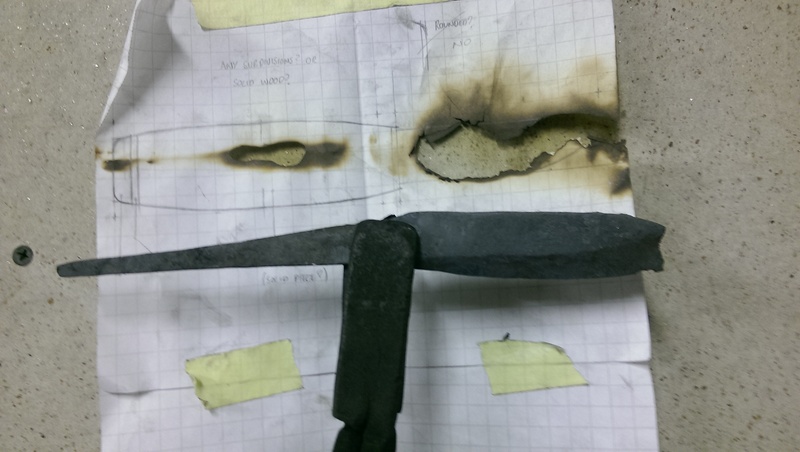 This forging process is lost in the mass-produced knives from the companies above. An ex student from the course I’m currently taking produces such knives. A Japanese man living in Finland, his knives are a fusion of two cultures closely linked with the blade. Take a look at his youtube channel to get a feel for what he does. 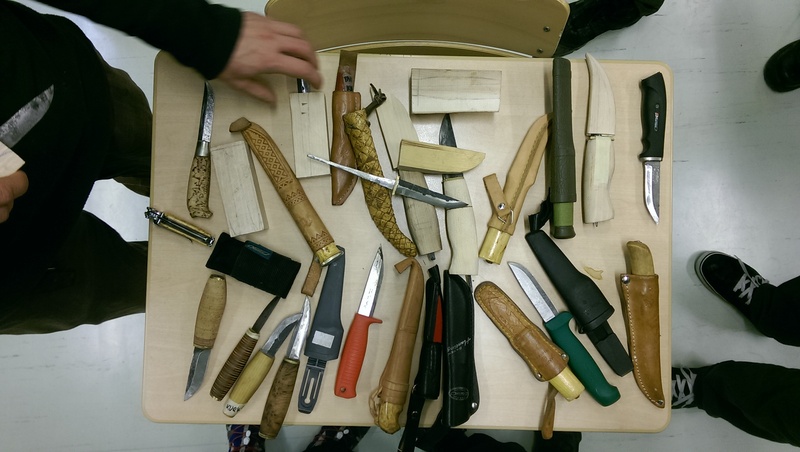 We started with a lecture on knives from our tutor Mikko, giving us a historical background and some design ideas. 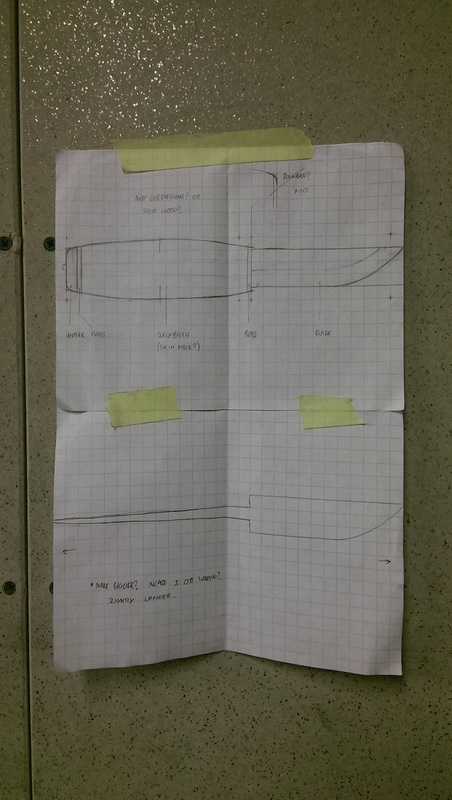 We scribbled our designs onto to some paper, which would act as a template for the knife throughout the construction. 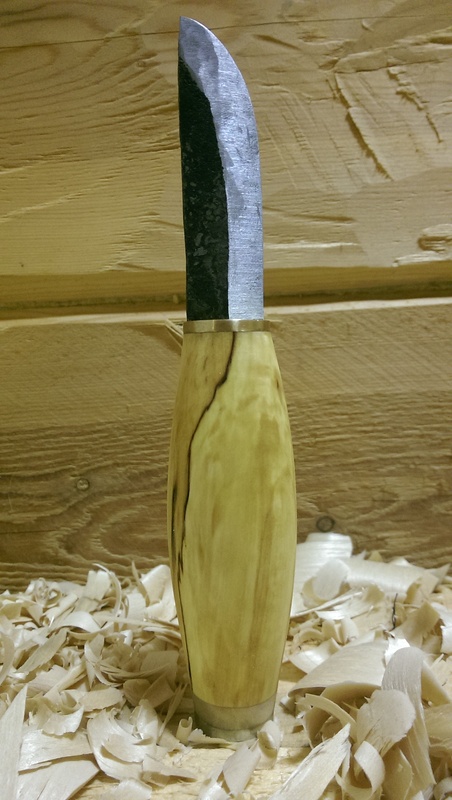 As said, the perfect blade length for a puukko is roughly the length of your palm, the handle often being the same size. Using one of Mikko’s traditional vintage knives as a guide and my hand as a rough judgement, I drew up something that took from a classic but with a fatter, rounder handle. Clad in ill-fitting overalls, we gathered in the forgery, looking like an excited bunch of hillbilly car mechanics. 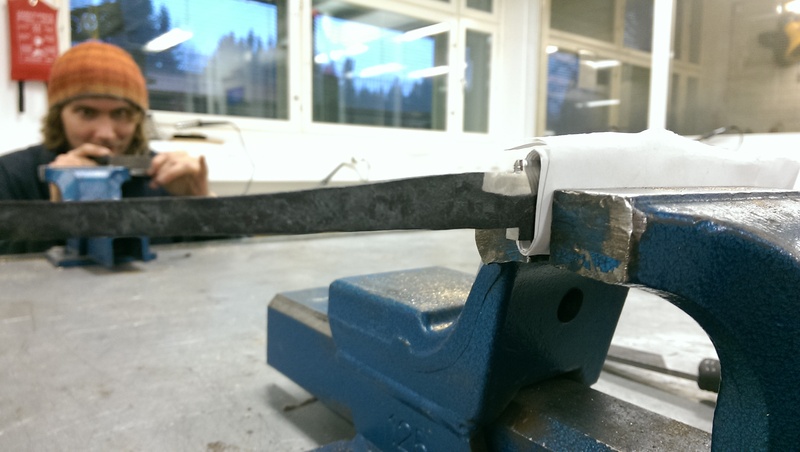 First, Mikko gave us a demonstration on how to forge the blade. 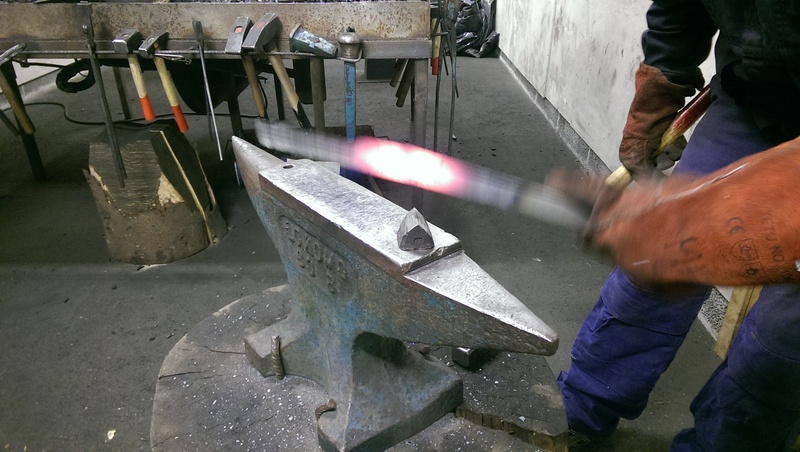 Like a master blacksmith he effortlessly manipulated a strip of steel through a process of heating and hammering and finally grinding into a shining blade. I might be speaking for myself on this one, but I didn’t have a clue how I was going to replicate what he had just done. When someone makes a complicated process look so easy you know it is going to be hard! 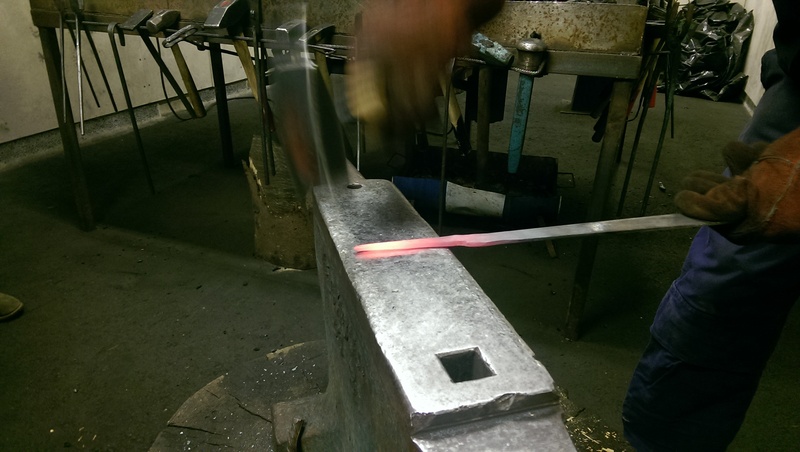 The idea is to form the shape of the blade as accurately as you can by hammering. 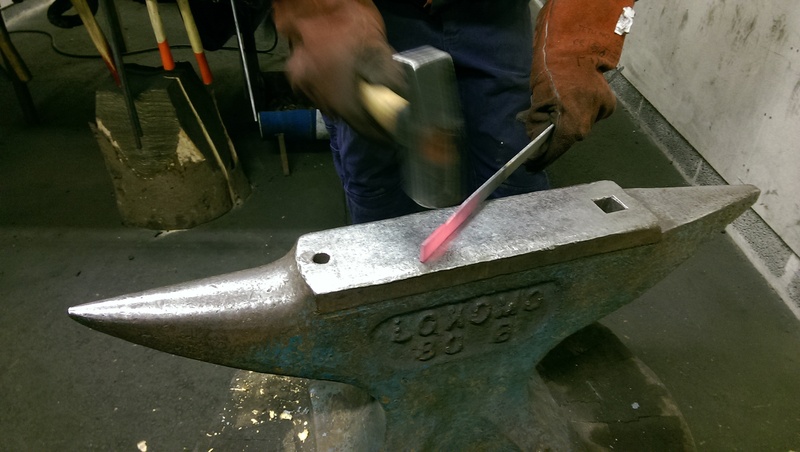 Hammering, is when you heat the metal till it is glowing bright orange, around 900°C, then hitting with a large hammer to gradually mould it to the desired shape. We were told to treat the metal as if it were play-doh and that the only difference was we were using bigger tools. The emphasis here is, that just like a soft putty, you need to be careful when working the blade as you can easily melt or deform the metal. Why hammer when you could just cut out the shape of the blade and go from there? Well, when you hammer you are compressing the molecules of the steel into the desired shape, making the blade stronger than if you were to cut them off. Apparently there is much debate between blacksmiths on the quest for a perfect blade. Some claiming that the perfect blade is one where the blade does not need to be altered in shape at all after hammering. Others disagree, believing that this doesn’t make much difference, only being harder to achieve and taking longer to do. Me, I am just happy if it will loosely resemble a knife. 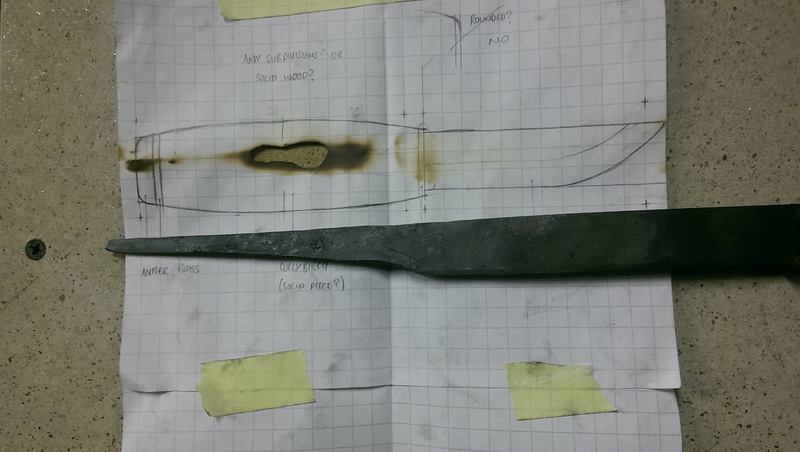 The large knife companies mentioned above actually just cut and grind the metal to shape, with no blacksmithing. This is because the quality of metal available nowadays is so high and can be worked in such a way without reducing the blade strength. And because of the huge number of knives they produce, blacksmithing each one would be a laborious and costly process. We started by making the fire. Firstly add a small layer of charcoal above the bellow. The bellow blows air into the fire, allowing you to control the heat. Make a fire on top of this, adding charcoal to the edges first, allowing it to heat before you start burning it (it spits otherwise). After the charcoal is warm, add to the fire and turn the bellow up to create a red-hot glowing fire. Continue adding charcoal in the same way when needed. We then got a length of steel, long enough to safely hold at one end. After heating the metal in the center we made a dent by placing it on the edge of the anvil and quite simply, whacking it a few times. The first stage was to make the tang. What the hell is the tang I hear you ask!? 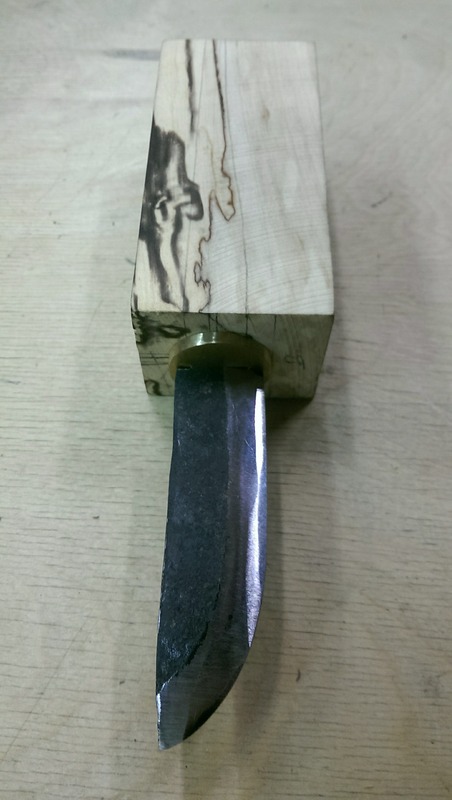 It is the bit of metal contained in the handle, and it important for this style of knife to create a strong handle that will remain rigid for the lifetime of the knife. So after crudely making a dent in the middle of the metal, it was time to tang-o. I’m not even ashamed about that awful pun. 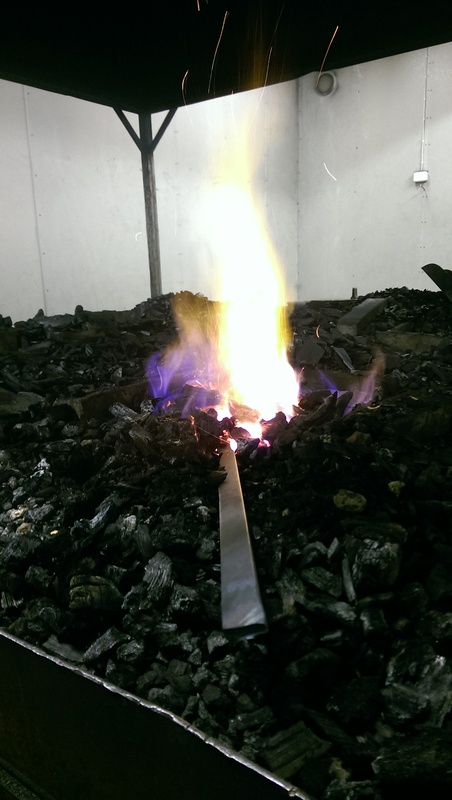 What followed was a process of heating the metal to a bright orange (around 900°C) and then hammering to slowly mould the metal into a long thin tapered end. Once the tang was complete it was time to move onto the blade. This is tricky, because you have to work backwards. Firstly you cut the metal to length by heating, placing upon a pointy addition that fits into the anvil, then use the whack and hope technique described earlier, finally snapping it using some pliers. The angle of this cut needs to be opposite to the angle of the final blade. The next part is tricky to explain, but you basically work backwards. You hammer the metal from the opposite side of the cut, slowly pushing the angled side up, becoming the flat top of the knife. 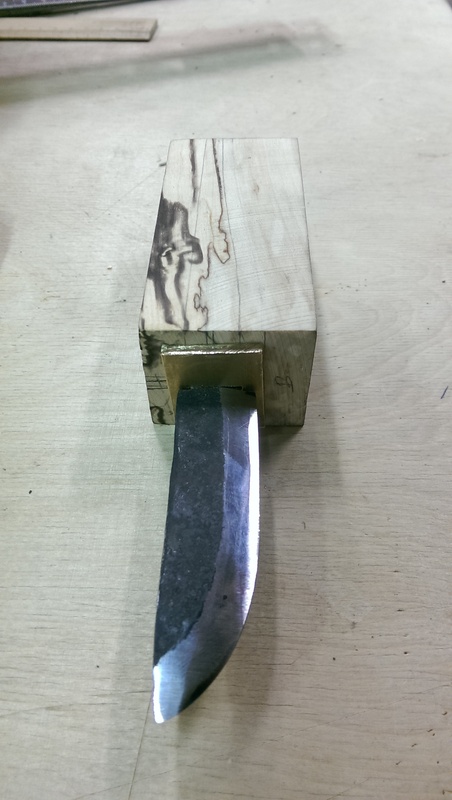 During this stage you are also creating the bevel of the knife, so you must place the metal at an angle whilst hammering. Sounds pretty complicated, hopefully the images below help to explain this process better. 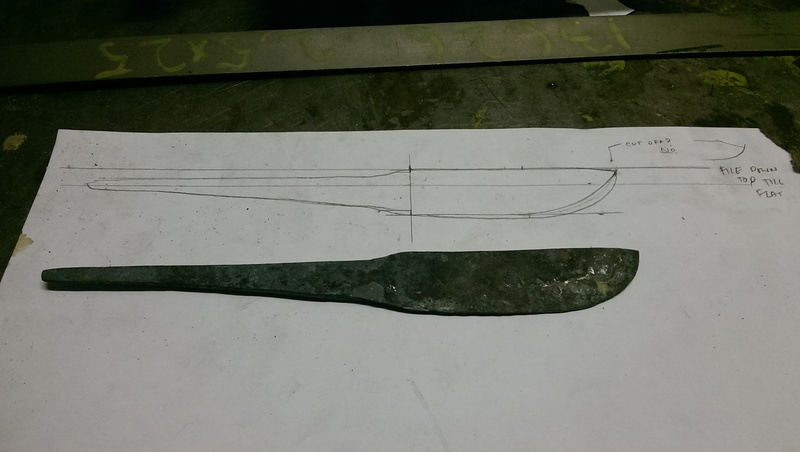 At this stage it was going surprisingly well, the blade edge was bending up, the bevel of the blade was beginning to show and the shape of the knife was starting to resemble the design. Then Mixu, one of my classmates started to take some photos. It looked spectacular when the bellows were turned up, causing thousands of burning hot orange sparks to whizz out of the fire, rushing into the chimney above. Whilst posing for a photo, I turned the bellow up, making loads of sparks and dramatically heating the fire. I stupidly left my knife in whilst doing this, melted the end off! Oops! Good photo though! (Will add it in once I receive it). At this point it was the end of the day, and I decided to resolve this problem the following morning with a fresh outlook. We all staggered out of the forgery, tired from a long hot day, beads of sweat dripping from our soot smeared faces, we resembled a motley crew of Victorian chimney sweeps. 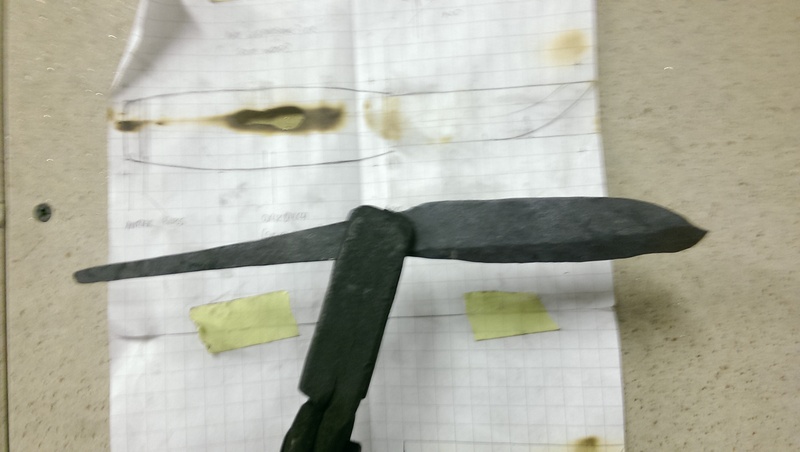 Although, a master blacksmith would not be happy with my fix, the following day I had to grind the knife to the desired shape, saving me from forging a new one! 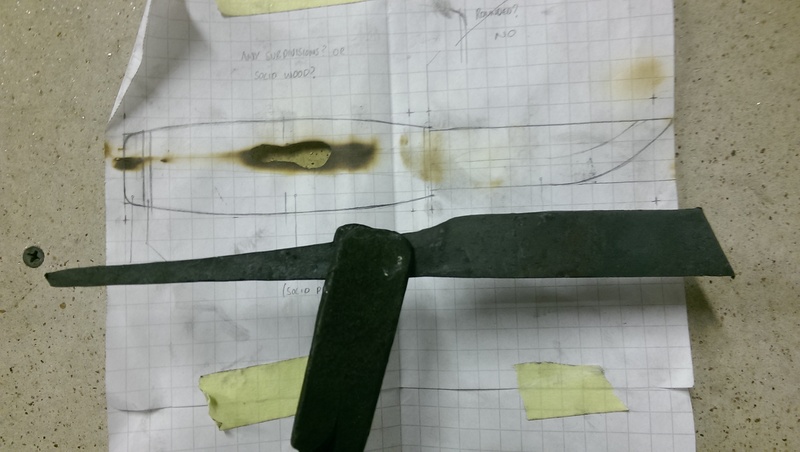 After some small alterations to straighten the tang it was time to do the first phase of hardening – annealing. 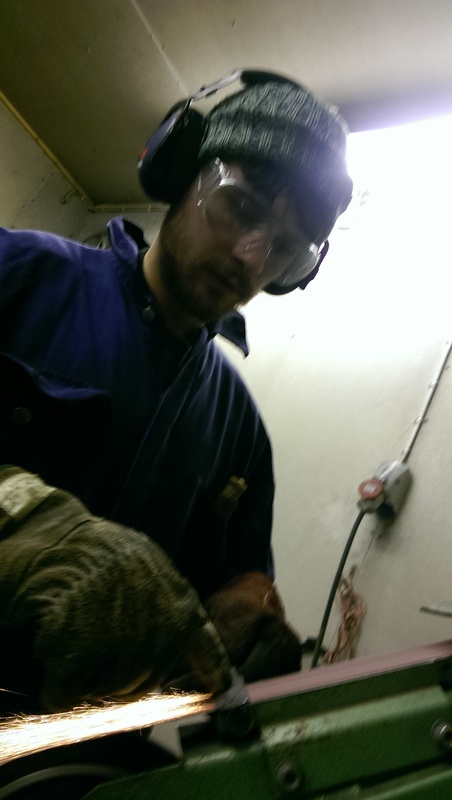 This is where you heat the whole of the metal to 600°C and then let to cool naturally. After the knife had cooled, the bevelled edges of the knife were grinded to form the shiny part of the blade. 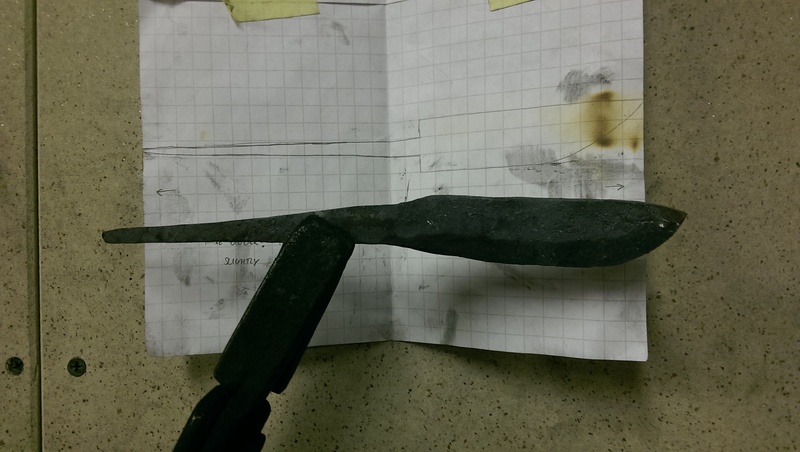 The key to blacksmithing the tang and the blade successfully is to take your time and relax. At the start, you cannot fathom the possibility of how to smith such a blade. But gradually, through a steady process of heating and moulding, and treating the metal like play-doh, a blade is slowly born. 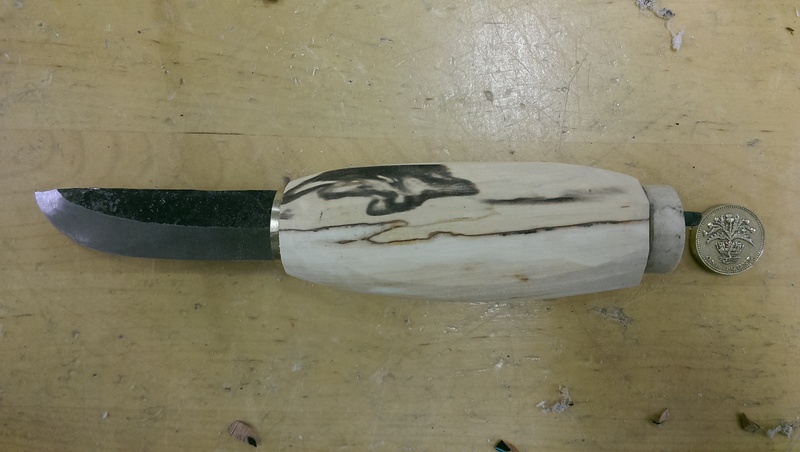 The next step was to make the handle. 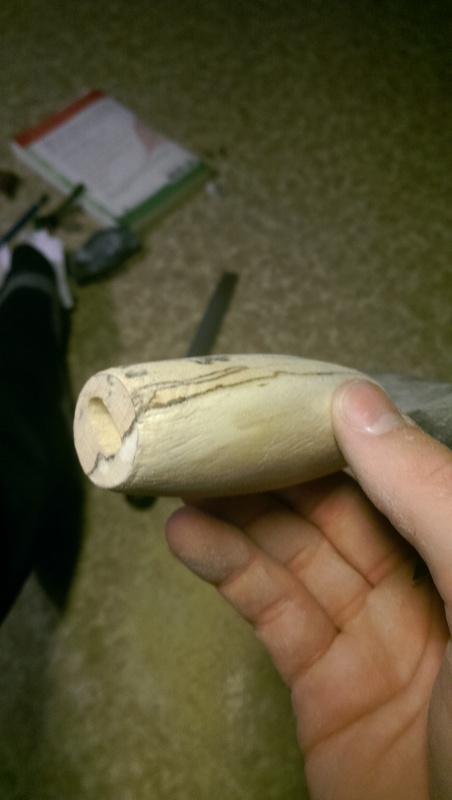 Puukkos traditionally use birch for the handle. I used curly birch, a subspecies of silver birch, which has vivid veins of colour meandering though the grain. The shape would be cylindrical, with a fatter section in the middle for grip. 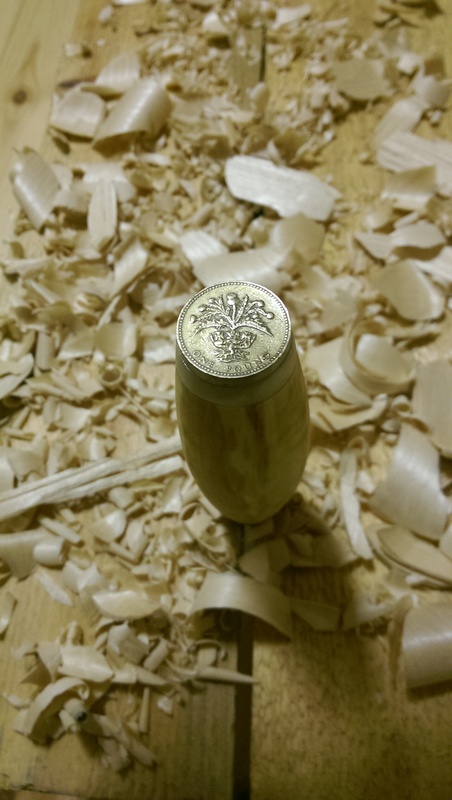 There would be a circular brass stopper beneath the blade, a main body of curly birch, a small section of antler and then a British pound coin as the end piece. A quintessentially Finnish knife with a British twist. First the knife needs to be prepared further for the handle, filing the top and bottom off the tang, see pic. We started by cutting the curly birch roughly size, and then creating a hole for the tang, allowing it to pass through the wood. 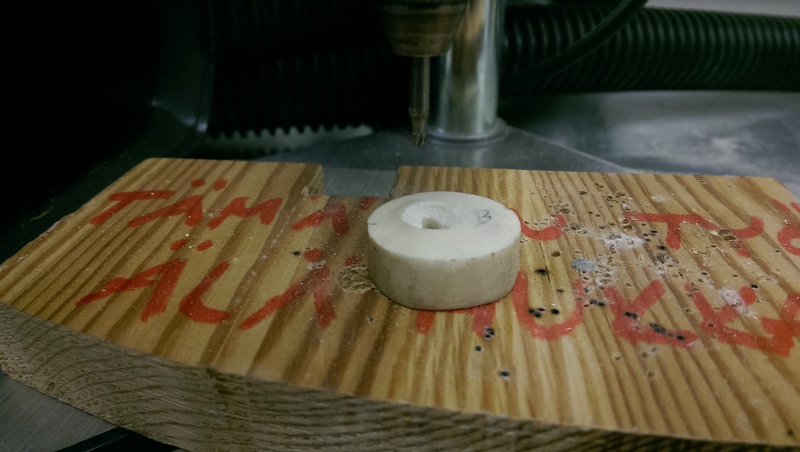 Firstly you draw around your tang, marking the area you need to drill. Then a fairly clumsy drilling process ensues. 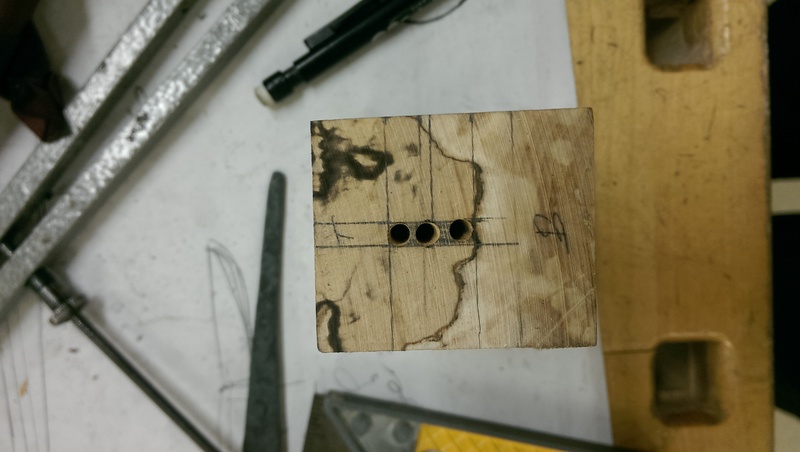 The first few holes are drilled accurately to your markings, and then you must use an electric hand drill to move the drill bit up and down to join the holes, creating the tang shape within. Takes a while of jostling before it actually fits, you want a nice tight fit so that the handle is strong. 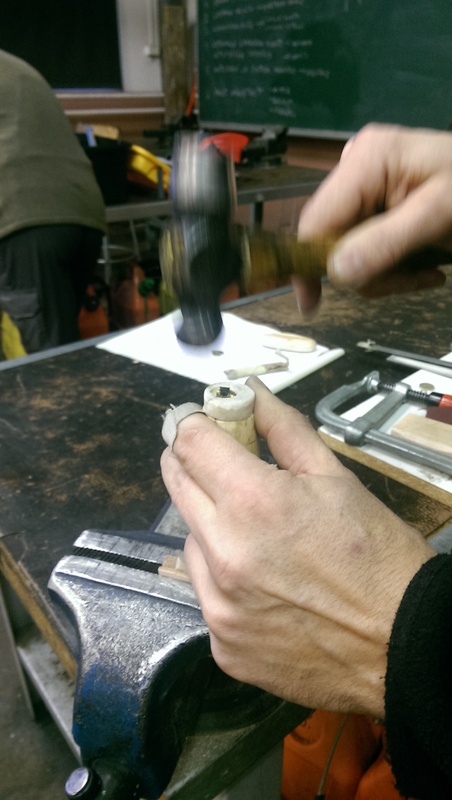 Once this was ready, it was time to create the circular brass stopper that would go beneath the blade. 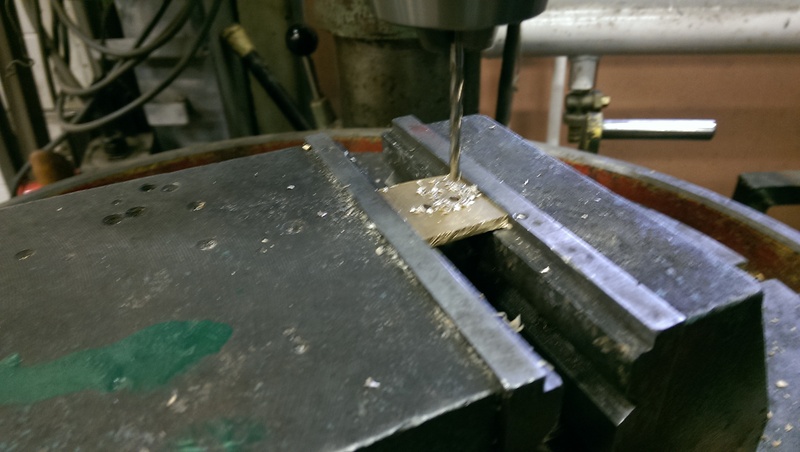 Holes were drilled through this plate first and a square opening was filed, allowing the blade to slip through. The circle was then created using a grinding machine and holding with some torque locking pliers to ensure you didn’t burn your fingers. No easy task, and took longer than expected to create the circle. I messed up the first attempt and so had to make another one. I wasted almost a whole day making a tiny circle out of brass! I nearly cried. 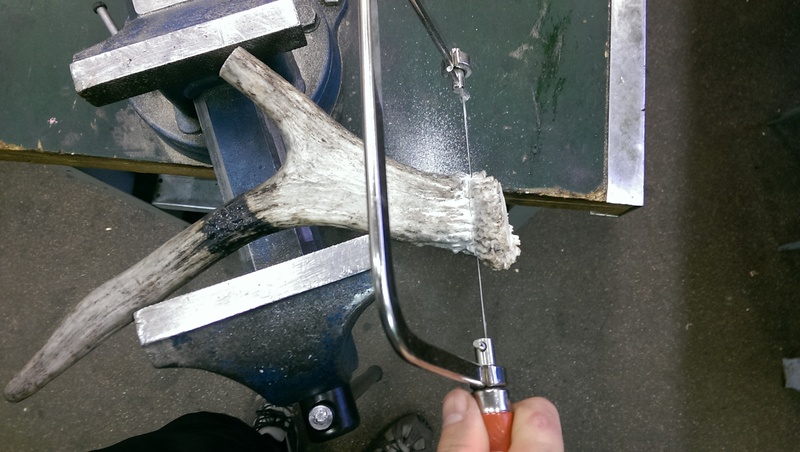 The same was then repeated for the antler which would go on the end of the handle. 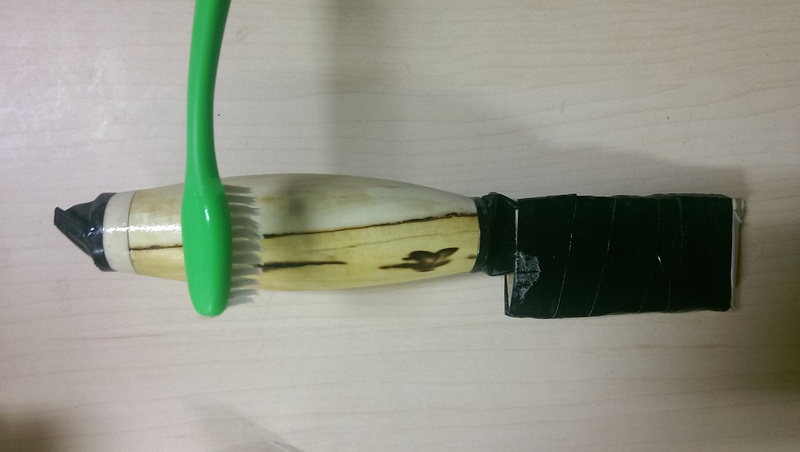 It was sanded to a cylinder shape and then a hole was drilled to allow the tang to pass through. Another larger diameter hole was also countersunk into the antler halfway, allowing a washer to be hidden inside the antler. 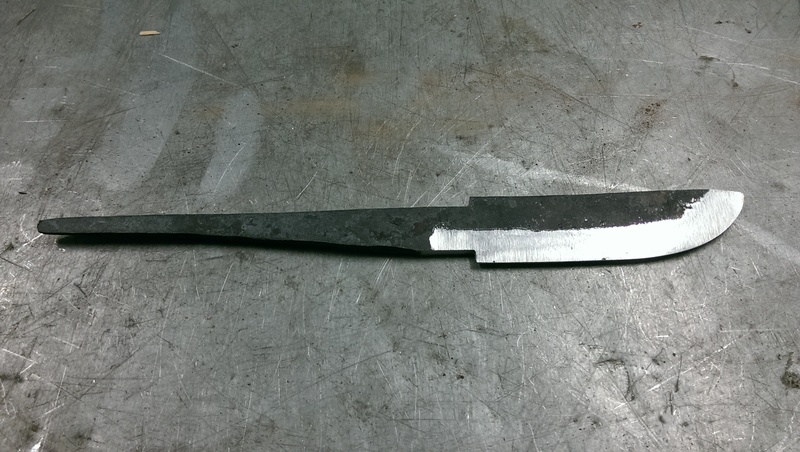 This is needed for when you rivet the tang onto the end of the knife, strengthening it. 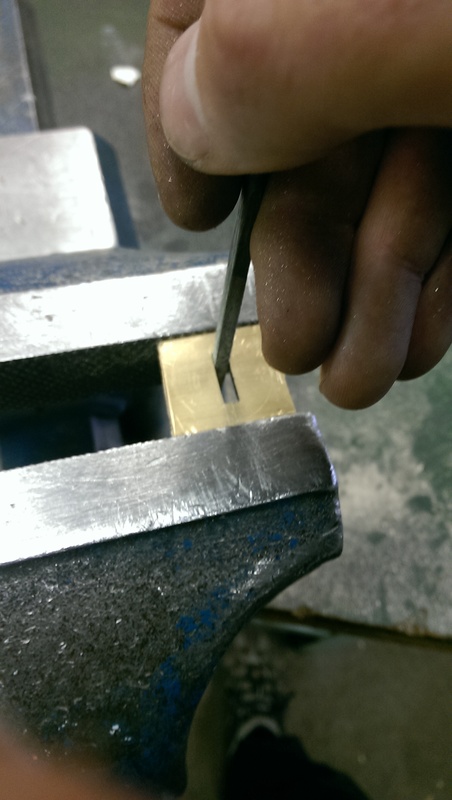 I also grinded the edge off the pound coin that was going on the end of the handle to give a shinier finish. 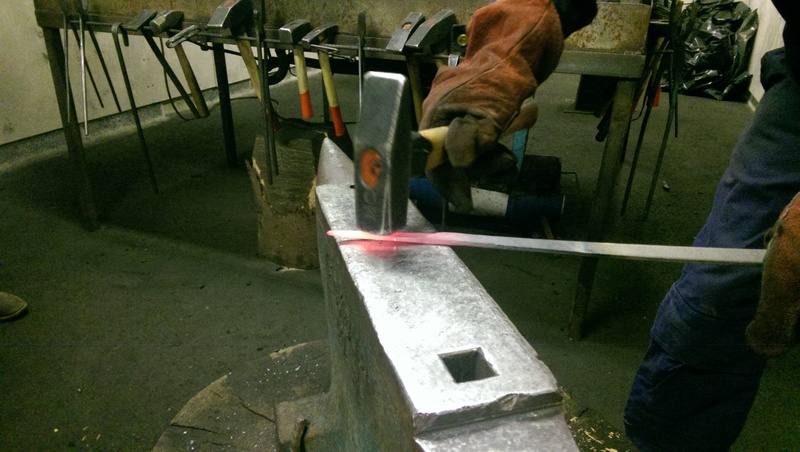 Stage 2 of the hardening process – hardening. 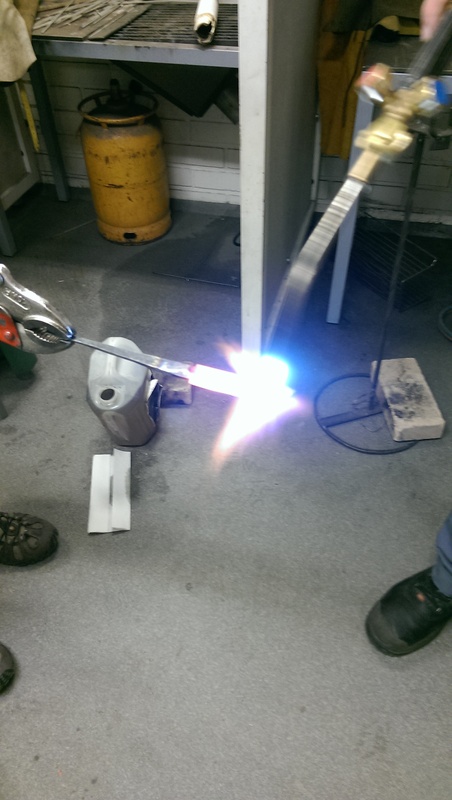 The blade was hardened by using a blow torch, the whole piece of metal being heated to start with, and then focusing on the bevel of the blade. Once red-hot, I think around 800°C, the metal is submerged in oil. The oil cools the metal slower than if using water, but means the end result is less brittle. 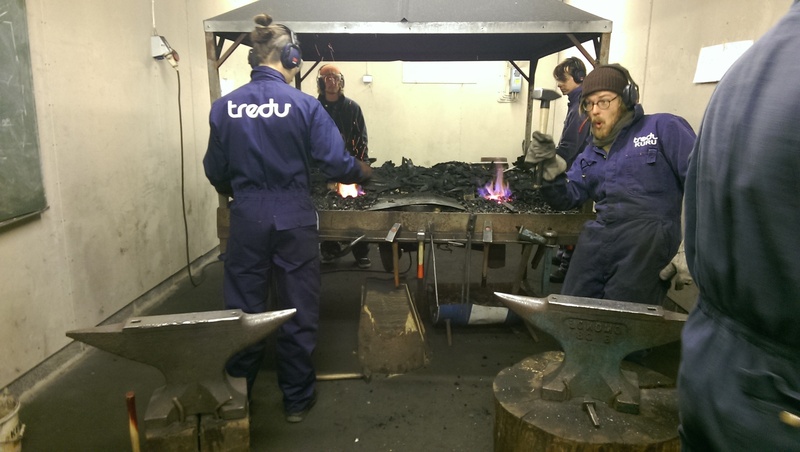 The steel is then cleaned, removing the quenching fluid and preparing the steel for tempering. 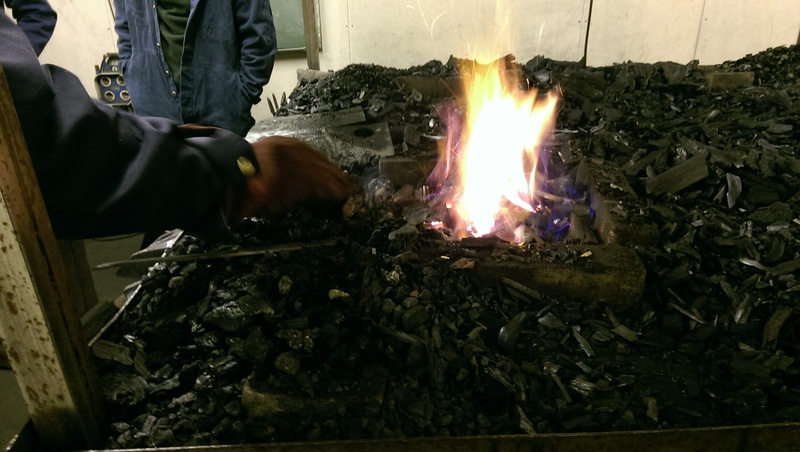 Stage 3 of the hardening process – tempering. The blade is then heated again, this time to 200°C in an oven for 20 / 30 minutes (Depending on the size of the blade). This takes away the brittleness created through the hardening process. 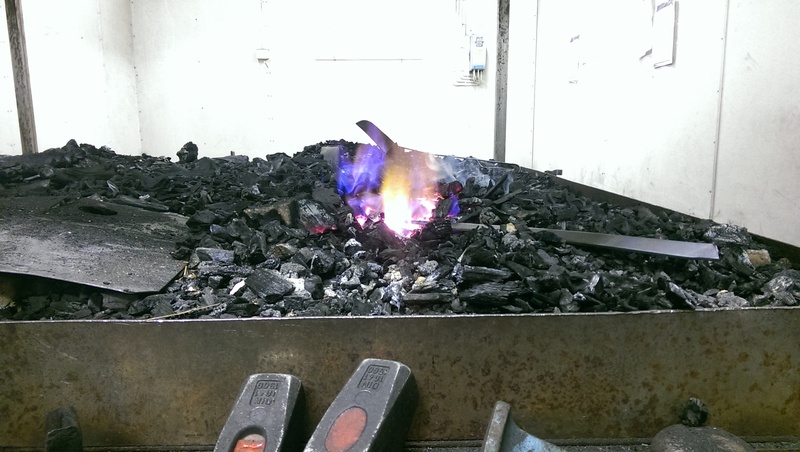 During the tempering process, the heated steel shows surface oxide colors according to how hot it is. Colors start with light straw at about 200°C through to purple at about 300°C. So be observant to the colour of the metal when tempering with an household oven as the temperatures are often slightly inaccurate. 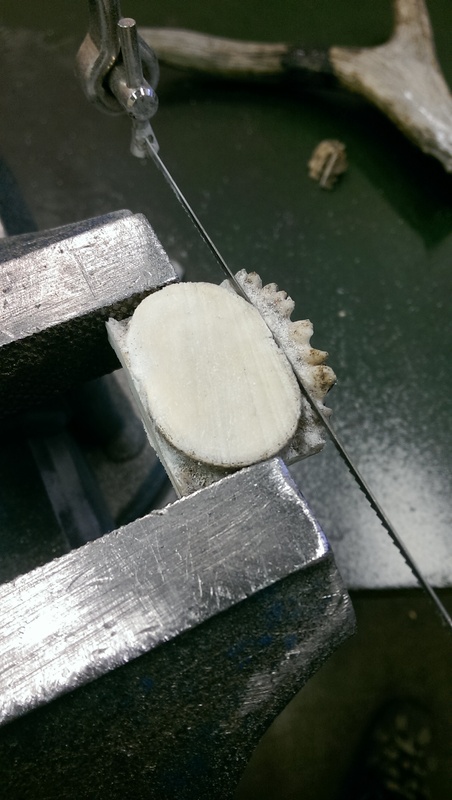 Once hardened, the blade is sharpened using a whetstone. A large, wet, cylindrical stone that rotates. You push the bevelled edge of the blade onto the whetstone, sliding the blade across, sharpening the whole length of the blade. 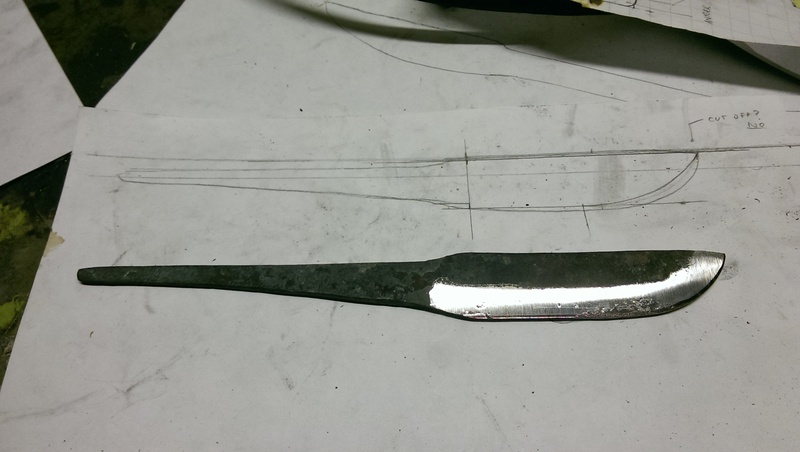 You do this on both sides of the knife, keeping the bevel even on both sides, continuing till you have a sharp edge. 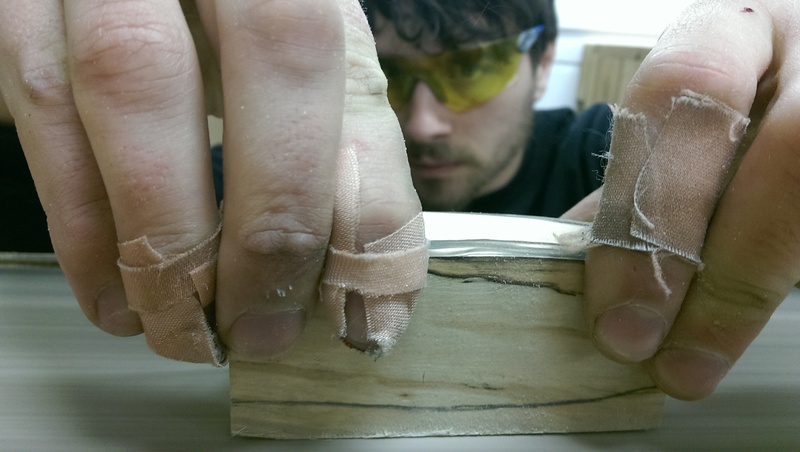 A tricky process, where I ended up sanding off the tips of 4 of my finger tips! Ouch. 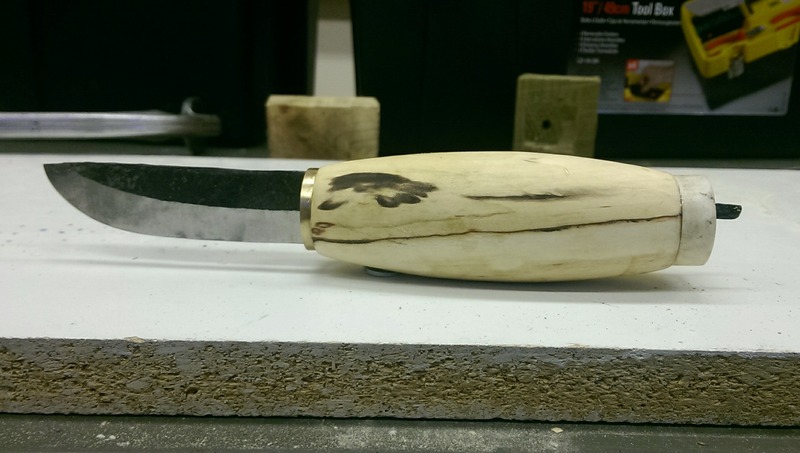 The handle was then sanded to almost final size, as once glued to the blade, it would be much trickier to sand. 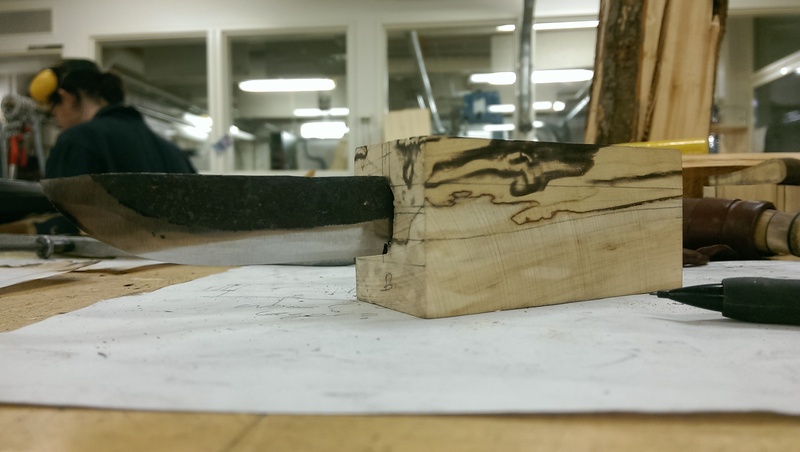 This was done firstly by using a belt sander to get a rough size and then using a rasp, which is a type of hand file. Favour the hand tools over the machine tools for intricate tasks, as the progress is more gradual, and mistakes can be resolved. If you make a mistake on the machine, you could ruin your handle in one slip. All parts of the knife (apart from the pound coin for the end) were then glued together and held tightly in place with a vice. 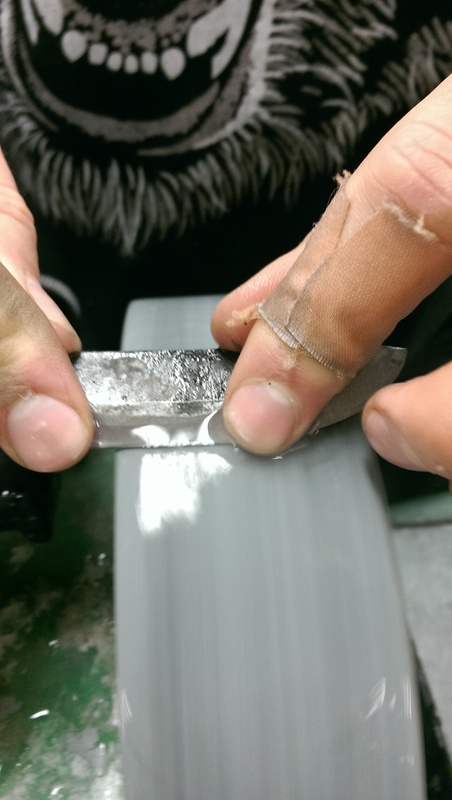 We used araldite with a 5minute curing time, allowing us to make small adjustments whilst putting into the vice, where we left it for several hours to cure. The washer was then placed in the countersunk hole in the antler. 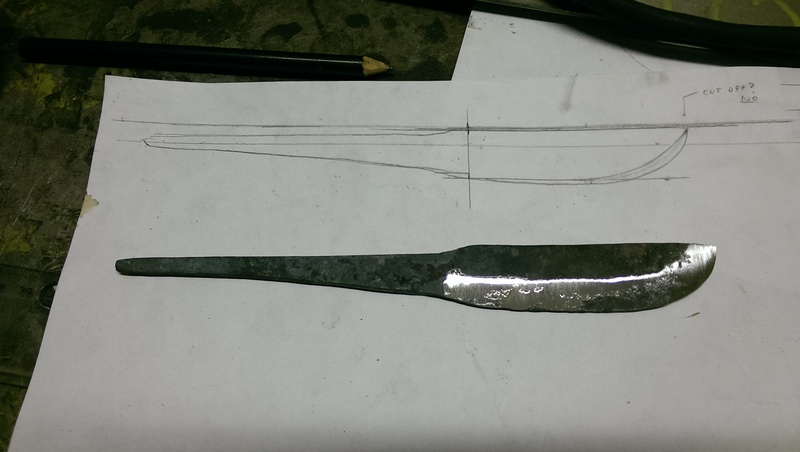 The tang that poked out was filed down slightly and then hit with the rounded end of a hammer to create a rivet, further strengthening the knife. A slow and unbearable process where I thought I was going to crack the antler. 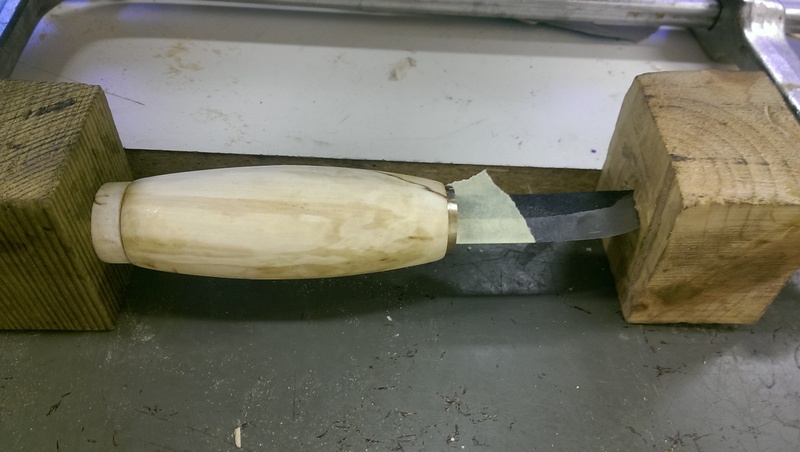 The knife was then almost complete, but the week was over and I still needed to finish sanding to final size, add the pound coin, finely sand and then hone and oil. I did this during the evenings of last week whilst on a work placement. 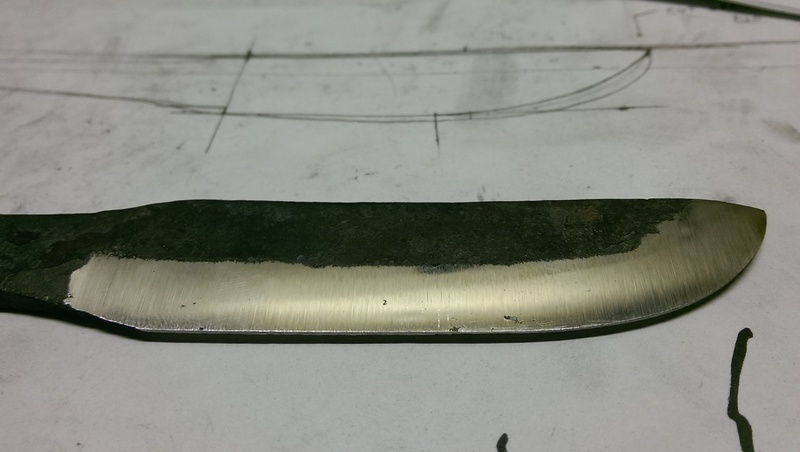 I sanded the handle to final size, being careful not to damage the brass under the blade. 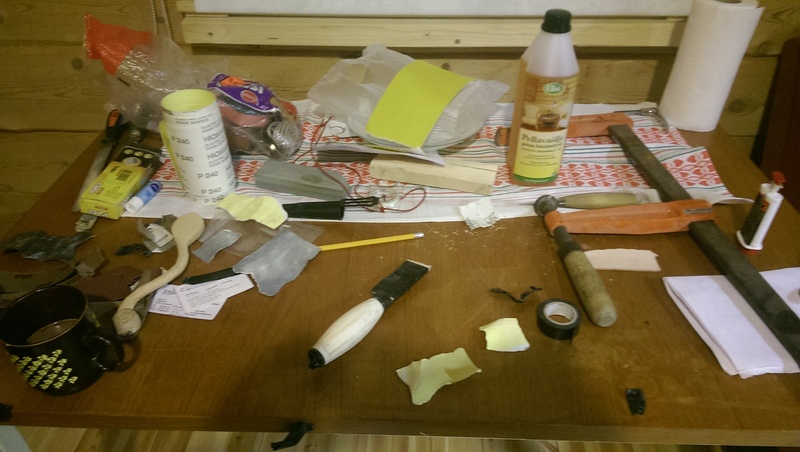 This time using a finer rasp and then gradually using finer and finer grades of sandpaper. 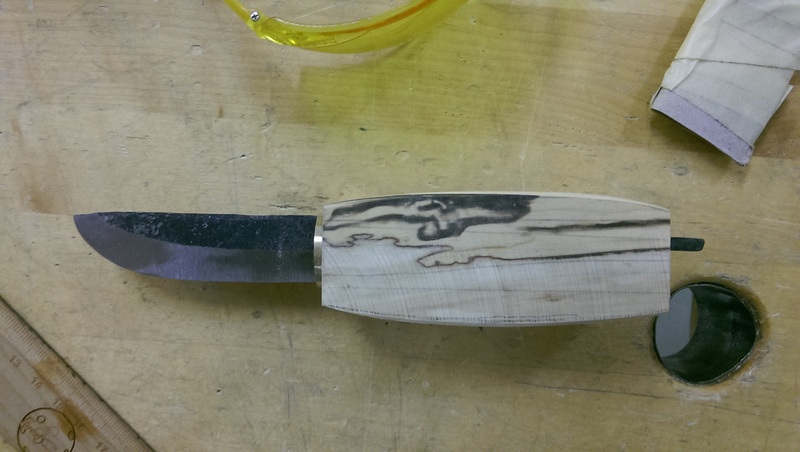 At the end, once the final sand was complete, I lightly dampened the handle and let it dry. This causes the grain to rise, so you then sand again to make the handle even smoother, and repeat this process several times. 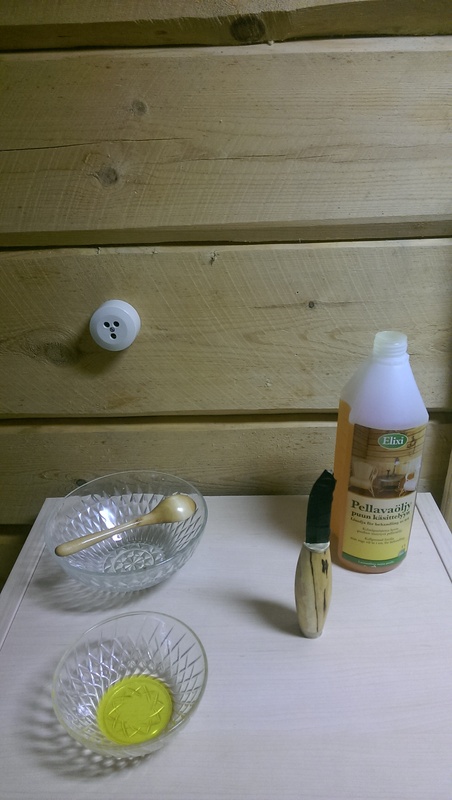 Then I oiled the handle with several coats of linseed oil (pellavaöljy). 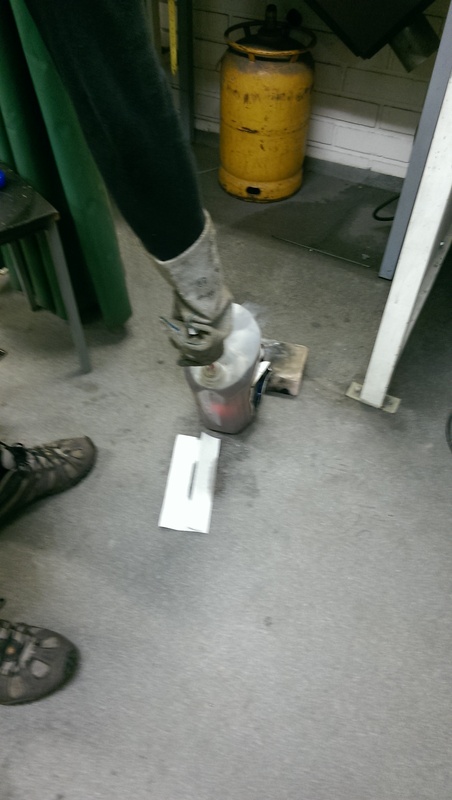 Be careful when disposing of the tissue or cloth you used to oil, as linseed oil can spontaneously combust! 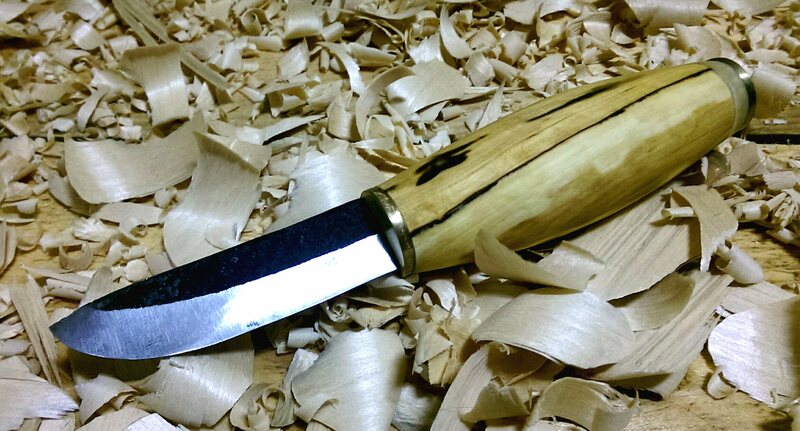 This entry was posted in Finland, Traditional Skills, Wilderness Guide Training and tagged black smithing, blacksmithing, curly birch, forging, knife, knife making, puukko, puukko knife, woodwork by mountchris. Bookmark the permalink.